In a small strip mall across the street from Taqueria Sanchez on Inglewood blvd in Culver City is Tacomiendo, one of the westside's finest taquerias.It’s the westsides answer to Baja Fresh serving up fresh made to order authentic antojitos and platos that you wont find at any of the cali-mex chains. 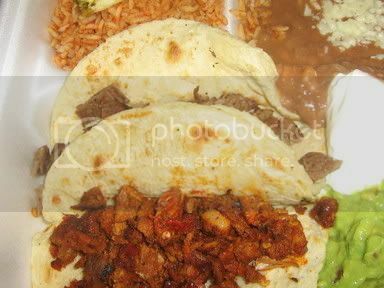 The menu consists of everything from birria to chile verde to burritos, tacos and tortas. I ordered the plato de tacos(carne Asada and adobada) and a bottle of mexican coke. They also have aguas frescas and fruit smoothies. jalapenos, carrots and a large pot of complmentary frijoles. The plato came with a generous scoop of fresh guacamole and sour cream as well as arroz y frijoles con queso. Both tacos came with homemade corn tortillas so fresh you can almost taste the masa. 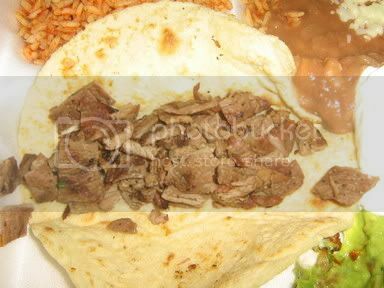 The carne asada lean, and tender with the taste of the grill seared into the beef was excellent with the dark salsa roja. The bold flavors and spice of the marinated grilled pork were calmed by the mild guacamole with the juice from the pork soaking into the toasted corn tortilla. Everything is made fresh to order at Tacomiendo so you may have to wait for your food but it is well worth it. If you're in the mood for something other than tacos I highly reccomend the chile verde con nopales. 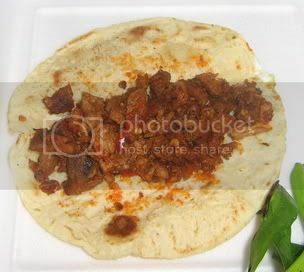 Wow, homemade tortillas for a taco is pretty rare, I've never heard of such a thing! Sounds like it should be quite good. Tacomiendo = esta comiendo = he/she is eating, clever. Seems I'm gonna have to rev up the carcancha to check it out. Be warned--Tacomiendo's burritos come standard with cheese and sour cream. Unless you're a super-gabacho, make sure to keep those off your order. On the other hand, Taqueria Sanchez puts lettuce in its burritos. WTF? I loooove miendo's fresh corn tortillas. I think they're asadas are on point, but I'm not feeling their pastors and carnitas. Yes, it's the bomb. Also a location at Pico and Gateway, or thereabouts. The marinade in the (al pastor?) pork was different and Amazing - definitely not the usual. Somehow I forgot about the complimentary frijoles. Good reason to return! 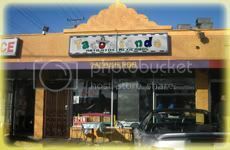 I live around the corner, an amazing spot to say the elast, one of Los Angeles' best real and authentic Mexican taquerias...It's the best spot bar none. the salsa bar carrots had garlic cloves in it...yummy. the lengua and cabeza are out of sight! I didn't see frijoles in the salsa bar, though...too bad! delicious place! Tacomiendo's carnitas are very crispy and delicious. I ate there for the first time last week, and I'll be going back for lunch many, many times. These are not your ordinary small, double tortilla tacos. These are like the ones you make at home: large, lots of meat, and super delicious! Also, any time you walk in and see the Horchata in a jug instead of the fountain, you know you're in for an authentic experience. Their dorado chicken tacos are some of the best I've ever had> The powdered cheese is incredible. Went for lunch this past Friday and had the Chile Verde con Nopales plate...it was the bomb!!!! Was if my grandmother had made it.